Within three decades, China, often viewed as an atheistic country, may be home to the largest Christian population in the world, the World Council of Churches says announcing that it is sending a delegation to the most populous country on the planet. The WCC which represents more than half a billion Christians said in a Jan. 4 statement that it is sending its delegation there as part of its 70th anniversary celebrations. The delegation will be led by the Geneva-based WCC's general secretary, Rev. Olav Fykse Tveit during its Jan. 7-16 visit to China. He said, "China has the world's largest population and is very significant partner in addressing the global challenges of our time. The church in China has a very significant role in shaping the Christian witness and service in our time, both in China and in the global fellowship." The delegation will visit Shanghai and meet with the China Christian Council and the Three-Self Patriotic Movement, as well as with the leadership and students at the East China Theological Seminary after the Chinese groups invited the WCC to visit. They will also travel to Xi'an and visit Shaanxi Bible School and Jing Xin Church said the WCC which represents Christians mainly from the Anglican, Orthodox and Protestant traditions. "Since China opened up to the world in the late 1970s, tolerance for religion has gradually increased, and religious life prevails in China and the numbers of baptized Christians in China have grown significantly," said the WCC, noting China's enormous economic growth. The church groups the WCC will encounter are the State-approved and backed churches that are linked to the State-sanctioned Three-Self Patriotic Movement. In April last year The Atlantic, however, wrote about an "explosion of faith" in China when it referred to the decades of anti-religious campaigns that followed the 1949 communist takeover. It said is giving way to a spiritual transformation noting that among the fastest-growing drivers of that transformation are unregistered churches. "Once called 'house' or 'underground' churches because they were small clandestine affairs, these groups have become surprisingly well-organized, meeting very openly and often counting hundreds of congregants," wrote Ian Johnson in The Atlantic. He said house churches have helped the number of Protestants soar from about 1 million when the communists took power to at least 60 million today. "Of these believers, about two-thirds are not affiliated with government churches. In other words, Protestants in non-government churches outnumber worshippers in government churches two to one," wrote Johnson. In his statement Tveit praised China for the development of its people saying, "Millions have been lifted out of poverty by this growth, raising renewed hope of the possibility of eradicating the most extreme forms of poverty globally. "In addition, we noted with appreciation China's example and leadership in ratifying the Paris Agreement on climate change and in scaling up its investment in developing renewable energy." The Three-Self Patriotic Movement is a Protestant church in the People's Republic of China, as well as one of the largest Protestant bodies in the world. The WCC delegation includes its Asia president Sang Chang and Peniel Rajumkar, who heads its Interreligious Dialogue program. "I am eager to meet more representatives from churches, particularly students and youth who represent the church of the future," said Tveit, a Norwegian Lutheran. 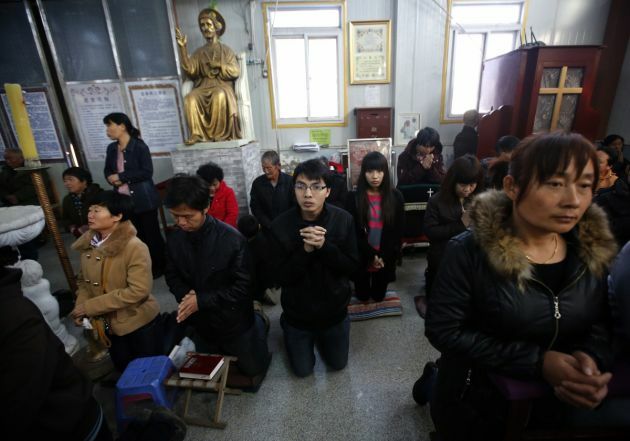 Religion in China may be mushrooming, but it is still under the watchful eye of the State. "The scale and severity of controls over religion, and the trajectory of both growing persecution and pushback, are affecting Chinese society and politics far beyond the realm of religious policy alone," the U.S. network quoted researcher Sarah Cook saying in a statement. Religious practice in China is tightly controlled by the government. There are five recognized faiths: Chinese Buddhism, Islam, Catholicism, Protestantism and Taoism. They are supervised by official organizations such as the Protestant Three-Self Patriotic Movement or the Buddhist Association of China. "Places of worship are registered, religious leaders are monitored, theological content is managed, and annual festivals or pilgrimages like the Muslim Hajj are organized under official auspices," Freedom House said. Open Doors, which monitors Christian persecution globally says there are some 85 million Christians in China. In its latest report on China it says that "a considerable part of persecution targets the small convert minorities among the Tibetans and the Muslim Uighurs, but Christians among the main Han majority face increasing restrictions too." It notes that the campaign of breaking down crosses in the Zhejiang province has ended, but church meetings continued to be disrupted in several provinces. "The new NGO law and the new draft regulations on religion are signs for tightening control on Christians in particular. As Christians are the largest social force in China not controlled by the Communist Party, there are increasing efforts to bring them under state control."